To comply with Nevada legislation that government fleets containing 50 or more vehicles must acquire alternative fuel vehicles. 5 million miles logged and 285,000 gallons of propane used over three years. $24 average savings per oil change every 5,000 miles. 1 million pounds of carbon dioxide eliminated over the life of the Type A bus fleet compared with gasoline models. 59,000 fewer pounds of nitrogen oxide emissions and about 1,200 less pounds of particulate matter for the Type C bus fleet compared with conventional diesel models. Almost 15 percent of total bus fleet runs on propane autogas. Washoe County School District is the second largest school district in Nevada. The district transports about 18,400 students to school each day on 257 daily bus routes. The school district’s attendance area spans over 6,325 square miles, comprising 93 schools. Since 2000, WCSD has operated alternatively fueled buses. The district initially purchased compressed natural gas buses after receiving a grant for a CNG station. WCSD then ventured into biodiesel and, more recently, propane autogas after learning about the fuel’s benefits from their bus supplier, Bryson Bus Sales. The bulk of WCSD’s 329-bus fleet runs on biodiesel; 47 buses are powered by propane autogas; and one is fueled by gasoline. The district’s propane autogas fleet is comprised of 12 Type A Propane Micro Bird and 35 Type C Blue Bird Propane Vision buses. Nevada’s Alternative Fuel Vehicle Acquisition Requirement mandates that government fleets containing 50 or more vehicles in a county with a population of 100,000 or more must acquire alternative fuel vehicles. Based on its size and demographics, WCSD must adhere to these requirements. Since 2013, WCSD’s propane autogas school buses have logged 1.5 million miles and have helped improve the air quality in the Reno/Sparks area. Each bus averages 20,000 miles annually. Equipped with ROUSH CleanTech propane autogas fuel systems, the buses emit 80 percent fewer smog-producing hydrocarbons and virtually eliminate particulate matter when compared to conventional diesel. WCSD’s propane autogas Type C fleet reduces nitrogen oxide emissions by 59,000 pounds and particulate matter by about 1,200 pounds each year when compared with conventional diesel buses. The propane autogas Type A bus fleet will eliminate 1.1 million pounds of carbon dioxide over its life when compared with gasoline models. The fuel systems are Environmental Protection Agency and the California Air Resources Board certified. Nontoxic, non-carcinogenic propane autogas is an approved alternative fuel under the Clean Air Act. The district’s main objective of incorporating propane autogas buses has been to reduce emissions, but it has also realized cost savings. Currently, the district pays $1.25 per gallon for biodiesel and $.98 for propane, without federal tax credits. Although the district doesn’t operate diesel buses, diesel in the Reno area averages $2.85 — a 65 percent per gallon cost difference compared to propane autogas. WCSD keeps on-going data collections to compare all aspects of its fleet maintenance which helps maintain a lower cost-per-mile. Post 2008 diesel buses require complicated emissions equipment, along with expensive maintenance parts and fluids. The district saves both time and money with propane autogas buses because these extra maintenance products are not needed. The district services its propane autogas buses with standard Blue Bird and Ford diagnostic equipment. Many of WCSD’s technicians already had experience working with Ford engines, and after some initial training, found propane autogas engines straightforward and easy to maintain. The district’s school bus drivers appreciate the quiet ride and the cleaner air resulting from reduced emissions. On board, the buses boast a safer ride to school as noise levels are decreased when compared to diesel counterparts, giving drivers fewer distractions. Drivers also note the strength of the buses’ torque and power. During the winter, WCSD’s drivers aren’t concerned with cold weather start-ups. With the ROUSH CleanTech fuel system, the propane remains in a liquid state until it gets to the cylinder. This has alleviated cold start issues associated with vapor technology propane systems of the past. Throughout North America, the fuel system provides unaided cold weather starts to -40 degrees Fahrenheit. To ensure that the propane autogas buses are driven to their fullest potential, the drivers receive regular training. 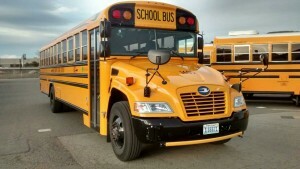 By continually revamping bus driver training, WCSD has increased fuel economy, miles per gallon and driver awareness. The district holds an annual driver competition contest for best mileage per gallon. The winner gets bragging rights — and other WCSD drivers learn the driving style that conserves the most fuel. All of WCSD’s Blue Bird propane school buses meet and exceed Federal Motor Vehicle Safety Standards. 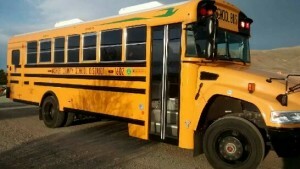 Washoe County School District operates three bus facilities. At its largest facility, the district installed a fueling dispenser with dual 1,200-gallon tanks. This fuel station accommodates the current fleet capacity of propane autogas buses. Each driver receives annual in-house training to ensure they’re fully aware of the safety produces that must be followed when fueling a propane bus. To extend its networking capabilities and best practices, WCSD joined the Energy Department’s Reno-Tahoe Clean Cities program in which Kelley is an active member on several committees. Kelley is also past vice chairman of the Rocky Mountain Fleet Management Association, Nevada Chapter. “Being an active member of both groups has also allowed me to better my own processes and abilities which directly affect my duties with WCSD and the community in a positive way on a daily basis,” said Kelley.